For the second day of enjoying a movie with snacks, I had to do a Popcorn no doubt! Though we keep making regular one, I have already made with different flavours. I have a caramel popcorn and I have made others, though it didn’t get shared here. I thought the Movie Date Snack for the perfect time to do another flavour for the blog as well. Most of our movie nights are with chips, popcorns and puffs. So I wanted to share some of what I normally make at home. This version with garlic butter and mozzarella cheese, was very delicious. Heat a pressure cooker without the washer or whistle on the lid. When the pan becomes hot, add the oil, salt and the kernals and saute well. Continue sauting till the first kernel pops. When it starts popping, cover it with lid and keep shaking it. Lower the flame to low/medium. 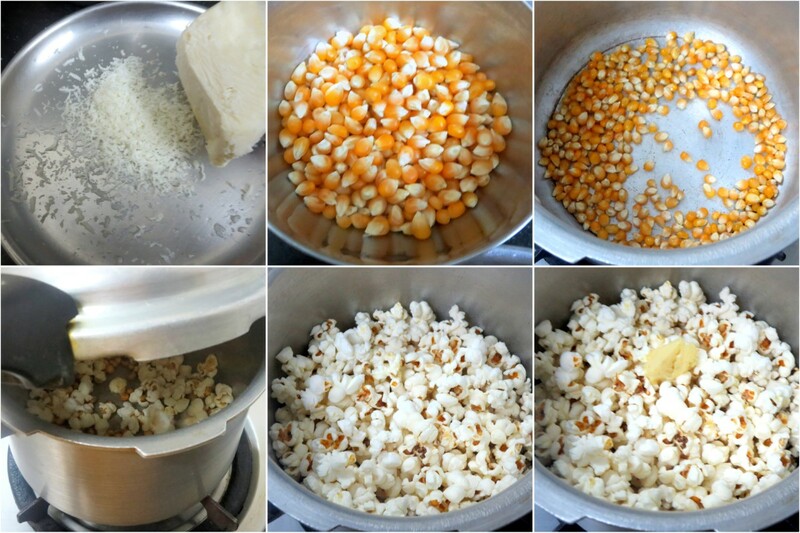 Once the kernels stop popping, switch off the flame and immediately add the garlic butter, cheese. Give one good shake so that the popcorn gets fully covered. Well, how can you not have popcorn on a movie night! Garlic butter cheese popcorn is tempting and you have presented it well. Omg, feel like munching these aromatic popcorns..love it to the core. That must be one yummy popcorn with the goodness of cheese and butter. I like the garlicky popcorn avatar..different and nice. Oh damn this root canal..i want to have these popcorns..wow amazing flavor!..love the way you presented it! 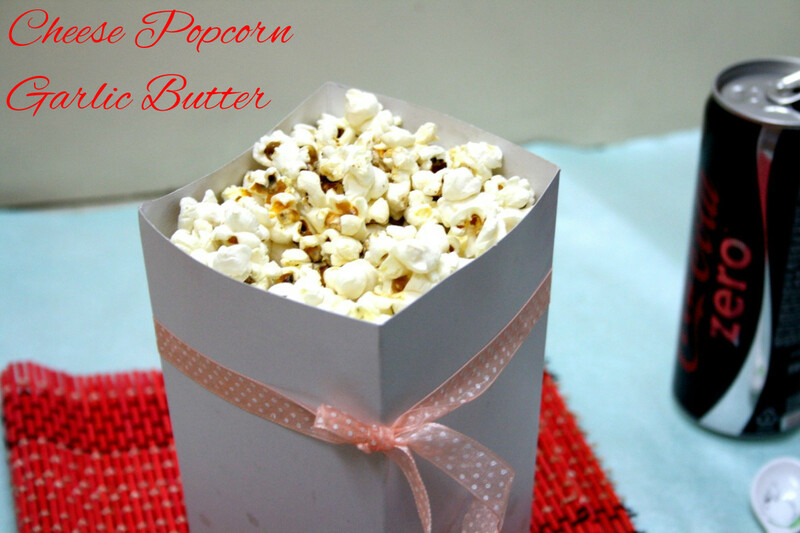 Popcorn looks really yummy… What a great snack to have this during movie time. Love the garlic flavor.. Pics are very nice. wow you get these corn there. I wish I had known. Anyway that is one awesome popcorn. My kids will definitely love this. Very interesting flavors. Looks perfect. 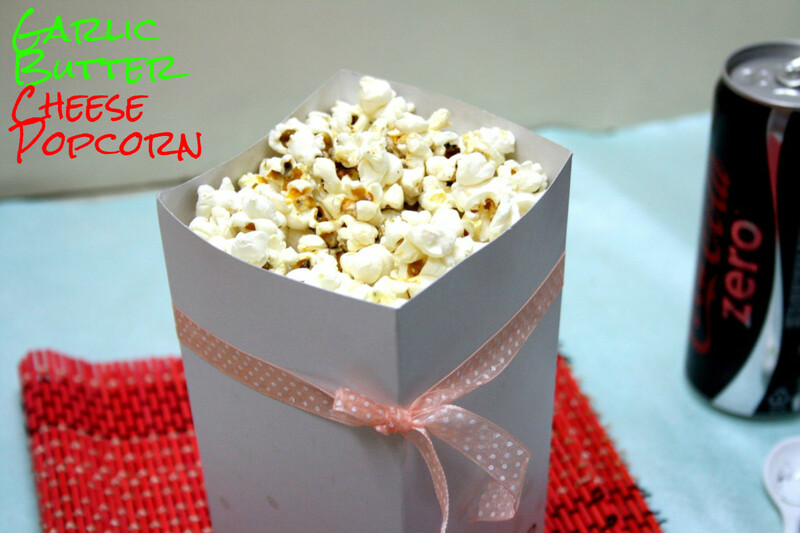 Garlic butter & mozzarella flavored popcorn sounds sooooo yummy!! Will have to try this one soon. Garlic butter and mozzarella, must have tasted yum, yum!!! So neatly presented valli, i like that holder very much!!! Delicious blend for popcorn! I can imagine how aromatic it would have been!! Vibha will love this and the way you have presented it feels like in we are in satyamcinemas!! Love the garlic flavor of the popcorn's. I would definitely try this and reshare the recipe on my blog. 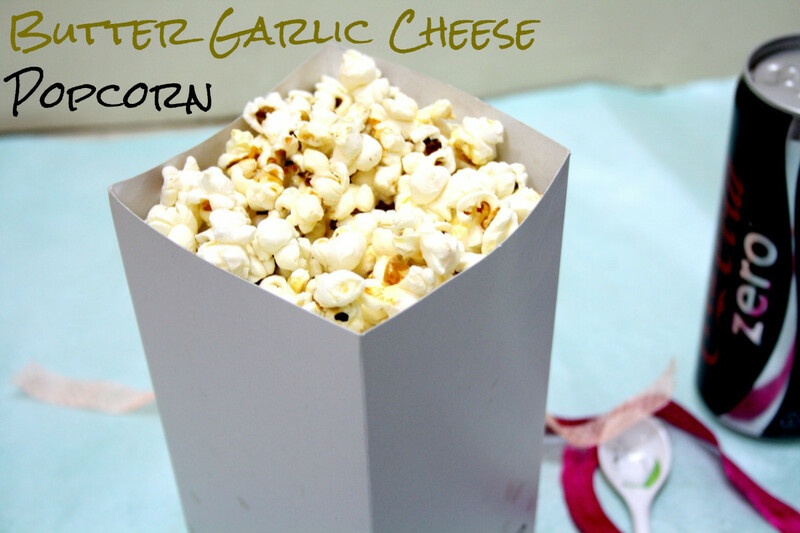 Garlic + Cheese + Popcorns = Heaven! Harshita, Thanks for dropping by, yes pls do try, it was heavenly as you said!